I’m sorry sir, but you just blew my mind. Trader Joe’s you simply never cease to amaze me. Although we may fight from time to time, such as when you mix kale and soybeans, you never fail to bounce right back and deliver something both shockingly clever or shockingly tasty. 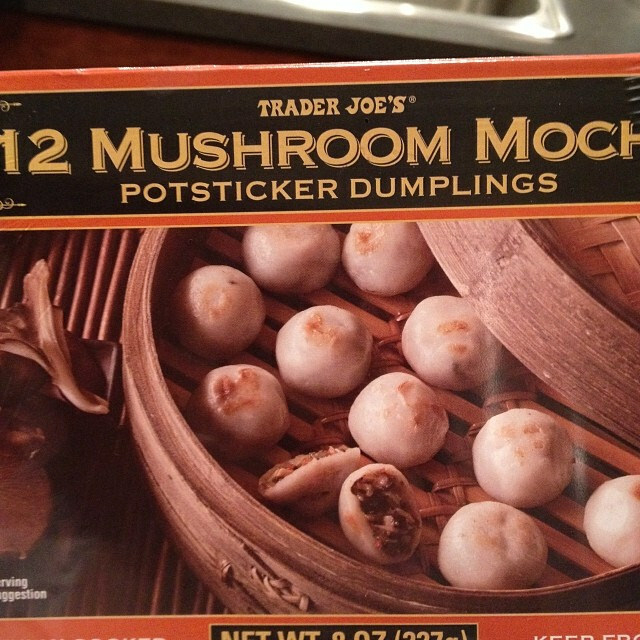 In this case, Trader Joe’s 12 Mushroom Mochi Pot Sticker Dumplings is both. What Trader Joe’s has done here is something unprecedented, bold and iconoclastic. They’ve taken an ordinary mushroom dumpling, a classic of Chinese cuisine, and remade it with a touch of a Japanese style. Chinese dumplings, classic potstickers, are traditionally made with thin, translucent wrappings made of flour and water. Trader Joe’s has kept the interior stuffing, but replaced the exterior wrapping with the marvelously soft, chewy and malleable mochi. For those of you know don’t know, and I hope that is very few of you, mochi is a type of dough made by pulverizing cooked rice over and over until, taffy like, it melds into a sticky, chewy, gooey blob. It’s a food that’s long been an integral part of Japanese cuisine – sometimes eaten by itself, sometimes as the delicious delivery system for a lump of sweet bean paste, sometimes (and most commonly in the States) as the elastic casing for a ball of ice cream. 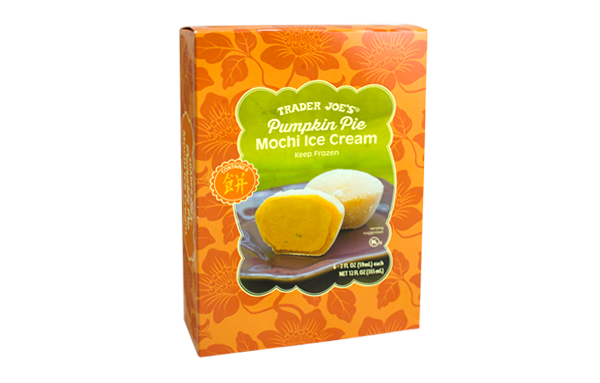 What Trader Joe’s has ingeniously done is to divorce the mochi of it’s sweet innards and replace them with a savory mushroom filling. The result is a dumpling unlike any you’ve ever tasted. 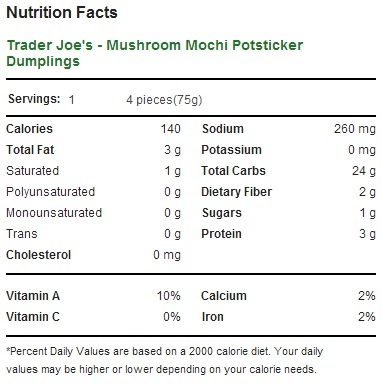 In fact, the pairing is so unorthodox that I don’t blame TJ’s for giving them such a long and unwieldy moniker as “Mochi Potsticker Dumplings”. There’s simply no easy description for such a unique dish. The result of this combination the best of both worlds – a lovely, chewy yielding exterior that gives way to a traditionally Chinese mushroom center, a mixture of Wood Ear and Shiitake mushrooms, carrots, bamboo shoots, and oyster sauce. The mushroom filling is loose, and relatively small in comparison with the thick mochi walls, but still full of savory flavor and entirely tender. 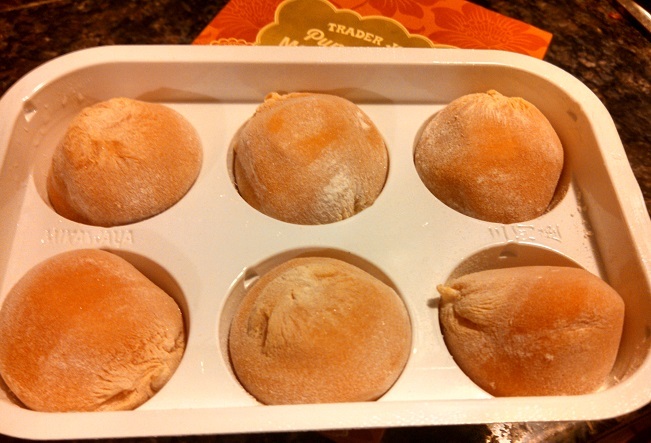 A quick trip to the microwave renders each little mochi dumpling wonderfully warm and soft. Sitting down and eating these little, pale orbs of pert dough is a tactile pleasure as much as a culinary one. The mochi extends and snaps with just the right viscoelastic properties – a delight of texture, taste and tensile strength. We’ve talked before about TJ’s tendency to append weirdly specific numerals to to the front of their products, so I won’t get into it again here. I’m pretty much against it in every case, except where the number can only be expressed in scientific notation. However, these mushroom mochi are so delightful that they rise far above their mundane numbering. Simply put, if you’re looking for an elegant and intriguing Asian side, these mushroom mochi dumplings won’t disappoint. Would I Recommend Them: Yes, to explore the intriguing recipie if nothing else. Would I Buy Them Again: Yes, this is some of the best mochi I’ve had in years. Final Synopsis: A hybrid Japense-Chinese dumpling that satisfies the senses.